The Chinese private corporation Junefield/Ecuagoldmining South America exported over 330 tons of minerals during its first trimester operating in the Ecuadorian highlands of Molleturo. Its Rio Blanco mine, located at 3800 meters above sea level, is one of five strategic projects developed by President Correa’s “Citizen Revolution.” In the early 2000s, Ecuador’s government licensed 5700 hectares of ancestral lands holding a rich hydric system in the Cajas reserve to the foreign corporation without consulting communities. The US$ 78 million project is expected to extract 240 thousand tons of gold and silver to generate a total of US$ 336 millions to the Ecuadorean state over a lifetime of 11 years. “It seemed impossible to stop a mine with so many millions at stake,” recalls Yaku Perez Guartambel, the Kichwa-Kañari lawyer and president of the Confederation of Kichwa Nationalities of Ecuador (ECUARUNARI) who led the trial against the mine. 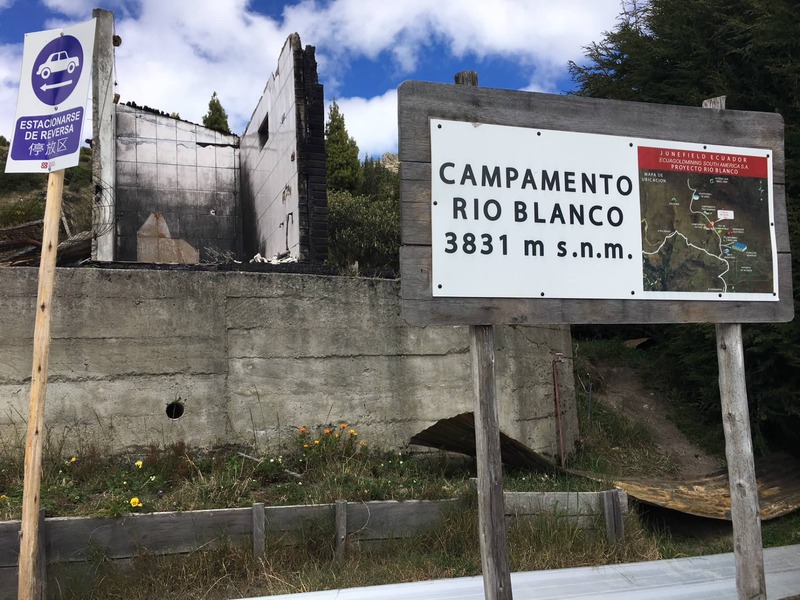 On June 1st 2018, a provincial judge ordered the suspension of all mining activities at the Rio Blanco project arguing that the Rio Blanco mine failed to have a prior consultation with indigenous communities as required by the Constitution (Art. 57.7) and international law (ILO 169). Molleturo communities visit the site of the Rio Blanco mine to make sure the activities are suspended as required by the court order. It was the state that appealed—not the Chinese corporation—ironically enough, through the Ministry of the Environment. Ecuador’s indigenous communities know that the state is the best advocate of mining corporations, even when there are leftist governments in office. The state continues to treat native land as terra nullius, dispossessing communities to sell resources on global markets. 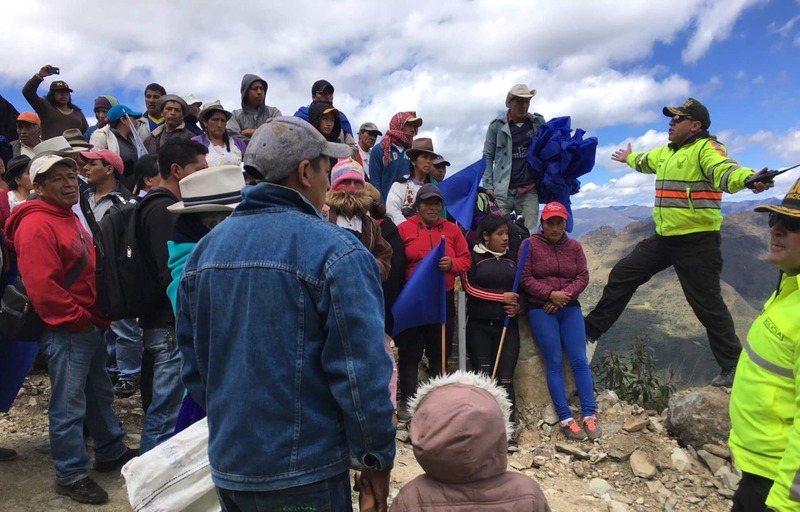 On August 3, 2018, Azuay’s Provincial Court confirmed the sentence, denying the appeal and confirming that the state and the corporation had violated indigenous rights to prior consultation. The final verdict was adamant: the immediate suspension of all mining operations and definite closing of the Rio Blanco mine. The impossible was no more. The Rio Blanco sentence set a historic precedent. It was the first time that a court upheld the right to prior consent since Ecuador ratified the ILO Convention 169 in 1989 (Art.6) and the UN Declaration on the Rights of Indigenous Peoples in 2007 (Art. 18,19). It was the first time that it upheld its own national legislation on prior consultation established in the 2008 Constitution. It took 29 years for Ecuadorean courts to finally abide to international indigenous rights and a decade for them to apply national law regarding indigenous collective rights. The sentence was a legal milestone marking the moment when legal theory became actual praxis. It was also the first time that a court ordered the closing of an active gold-mine with millions of dollars of foreign investment at stake in Ecuador. In the past, Indigenous and environmental movements had successfully slowed down the starting of extractive industries, but never had they achieved the closing or suspension of active mines. It was a significant legal precedent that proved beyond a shadow of a doubt that it is never too late to stop illegal, violent projects on native land. Further, the sentence was a historic victory against international capital. Rarely does justice prevail over the immense power of multinational corporations. Despite the fact that the private Chinese corporation intimidated nature defenders with death threats and tried to bribe their lawyer with US$ 18 million, the courts upheld the laws against foreign investment, defending the collective rights of indigenous communities against a national government that keeps selling territories to foreign capital. Last but not least, the fight against the Rio Blanco mine was a historic process of collective action. For the first time in Ecuador indigenous resistance against extractive industries achieved a favorable sentence in national courts. This represents a collective victory for the communities of Molleturo / Rio Blanco who have been peacefully resisting the mine project for nearly two decades. It was proof that collective resistance and community resilience can protect territories. Resistance to Rio Blanco was a collective process that counted with vast solidarity networks. Indigenous communities across Ecuador supported the struggle and ECUARUNARI supported the mobilization with the legal defense. The court received about half a dozen Amicus Curiae from universities, scholars and activists from across the Americas. Local media also played a key role in amplifying Indigenous voices. 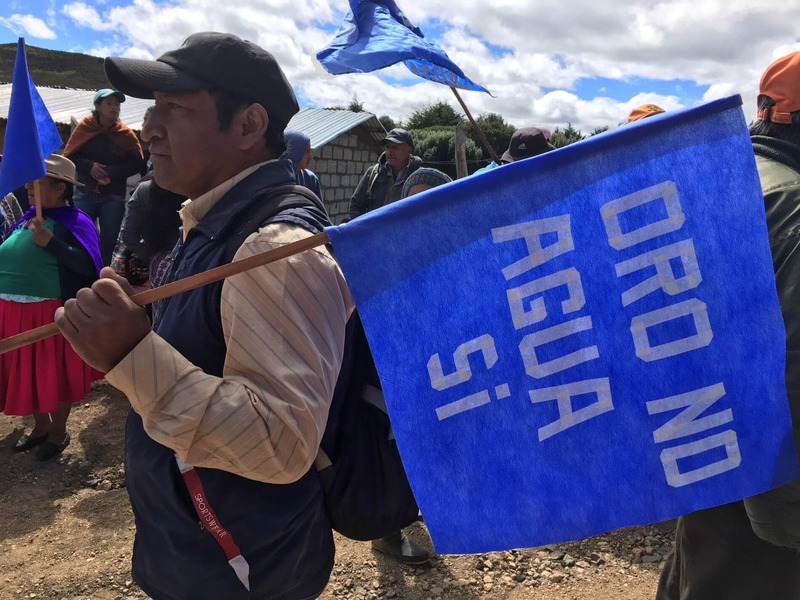 For months, local newspapers and radios like el Mercurio, Ondas Azuayas and Voz del Tomebamba broadcasted the voices of water protectors, interviewing them and confronting governmental representatives to legal rights, environmental impacts, and popular demands. Last but not least, indigenous communities counted with extensive popular support in the nearest urban center Cuenca. As Ecuador’s third largest city, Cuenca made its opinion heard voting 75% against mining in hydric systems and protected natural areas. Many cuencanos joined marches and the media in defense of the water resistance. But resistance came at a cost with criminalization. Water protectors are still at risk as the state uses its executive powers and legal system to silence resistance. Water defenders have been organizing resistance for over a decade, with peaceful protests, legal actions, and road blocks to filter access to their territories. The mining operations implied a massive water contamination in the highlands, spreading the toxic waste downhill. 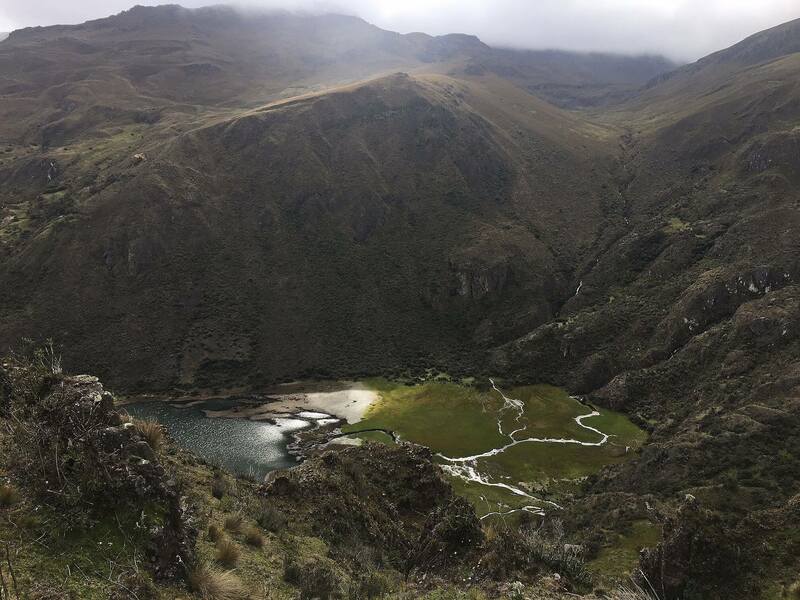 Ecuador’s water agency (SENAGUA) granted three rivers into concession to the Río Blanco project; the Migsihuishi river alone (3400 m above sea level), represents 13.11 liters per second. When toxic materials like cyanide started to flow down the rivers in the spring, community members grew desperate. Since no legal claims or peaceful contestation achieved results, some people took emergency measures. During the night of May 8, a small group set the mining camp on fire. Nobody got hurt, the incident only generated material damage that disrupted extraction. Police forces intervened in defense of the mine, but mistakenly jailed mine workers instead. The next morning, indigenous authorities came to mediate the conflict, but got kidnapped by mine workers who they believe were obeying orders from above. 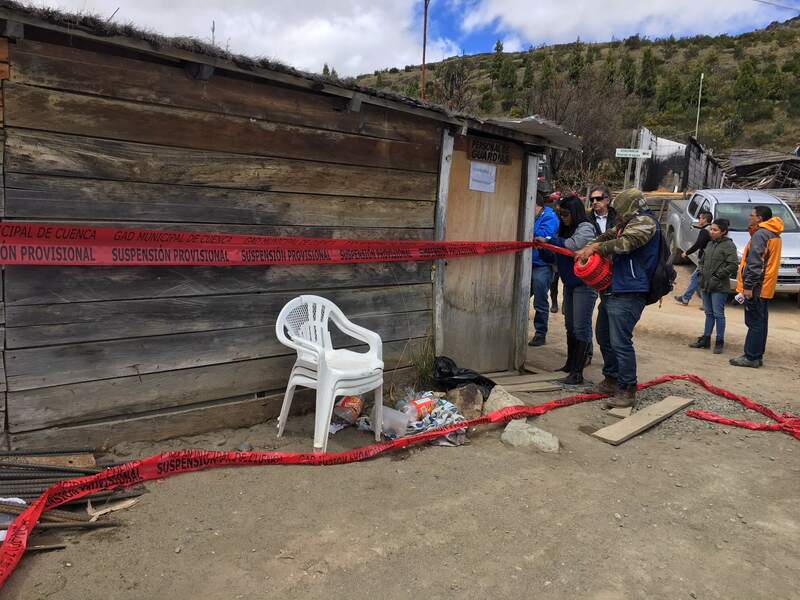 ECUARUNARI’s president Perez Guartambel; Manuel Guallas, an indigenous authority from San Felipe Molleturo; Mario Farez from the Federation of Kañari Organizations (FOA) and one more water defender were kidnapped as they reached the site of the conflict. They threatened to burn their cars with them inside for “blocking development,” and an angry mob kicked, dragged and tortured Perez Guartambel accusing him of leading anti-mining efforts. They planned on crucifying him and started gathering materials on the schoolgrounds. The ordeal lasted eight hours, until a group of journalists broke through with cameras intimidating the aggressors and rescued the water protectors. Shaken to their bones, the water protectors asked for protection, but the government instead chose to further criminalized them. The Ministry of the Interior charged the victims with the crime of sabotage; even the lawyers were framed as intellectual instigators. There are already 32 water protectors facing trial accused by their own government, and the number is growing. Water protectors are organizing the best they can to guarantee their safety. Perez Guartambel was able to free all the accused from preventive jail as the legal process unfolds—including the mine workers who were mistakenly jailed. They are also gearing up international support since they cannot count on state protection. In late August, the Inter-American Commission for Human Rights granted precautionary measures to Perez Guartambel forcing Ecuador to protect his life. Now the question is whether Rio Blanco’s legal precedent can influence more sentences. And it seems it can. In the Amazon, a provincial judge ruled in favor of the Kofan of Sinangoe against the government of Ecuador who granted 30 thousand hectares of their territories in concession to a gold mine without prior consultation. The Ministries of Mining and the Environment appealed, arguing with the usual incompetence characteristic of those who are above the law. All eyes are on the final ruling which is expected within weeks. It seems that the impossible may happen again.